It's nearly midnight and I'm ready to crash, but first a few words. We had snow this weekend and it made for a lovely Christmas day. Cold though, very cold but the nearly complete barn is doing it's job to provide adequate shelter to our limited livestock. 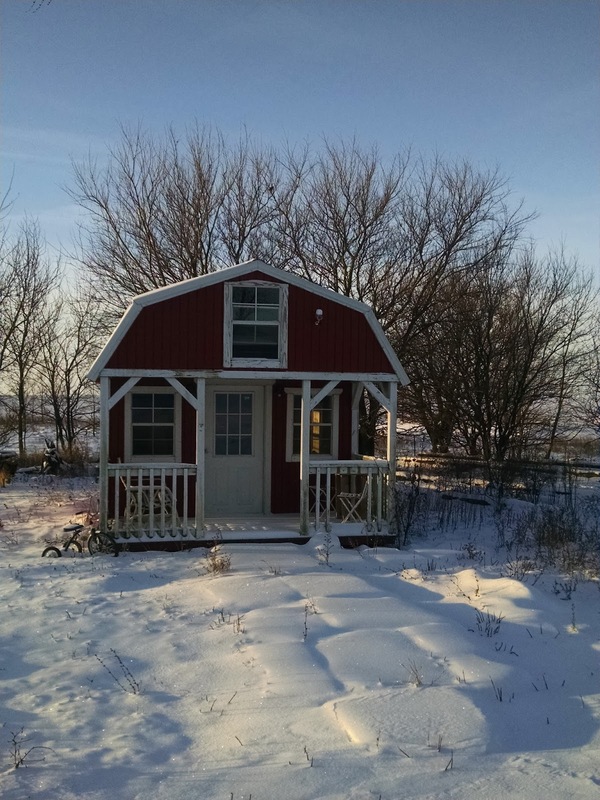 My writing studio above looks wonderful all tucked against the bare winter trees in the middle of our 7 acres and the broken up concrete from the old well house, which we used to make a sidewalk to my studio, looks like a snow covered quilt. I still do not have electricity or heat in my studio so won't be writing much in there until spring. Above and almost perfectly center, you'll see Keith in the early morning sun, pushing hay in a wheelbarrow out to our steers. 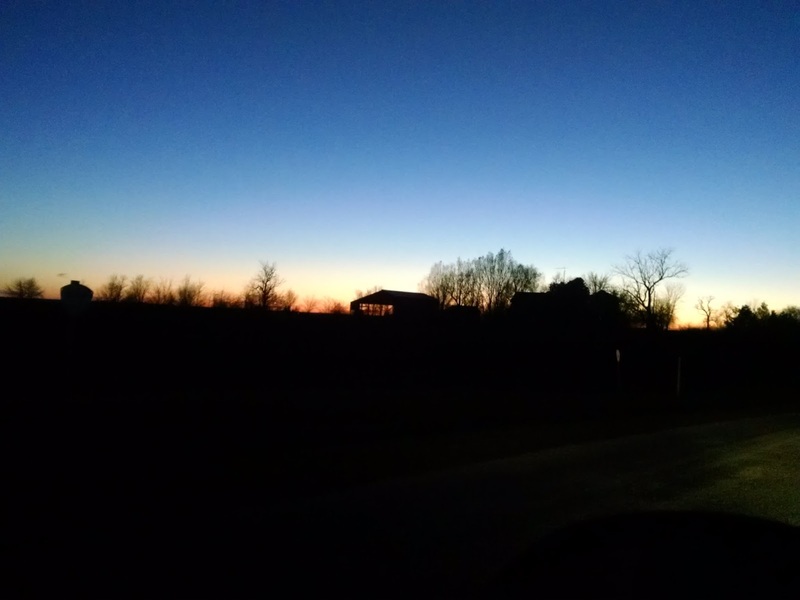 Once fed we drove the 12 miles into Pontiac where we met with our four children and their families to celebrate Christmas at oldest son Colton's house. 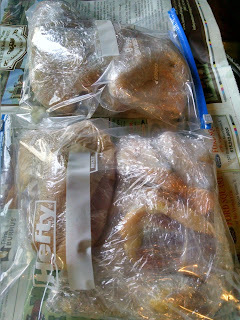 His wife Tab, provided us once again with gallons of coffee, hash brown casseroles, chocolates and homemade cream puffs. Heaven it was. Our day and our hearts, were overflowing with blessings. Merry Christmas everyone! 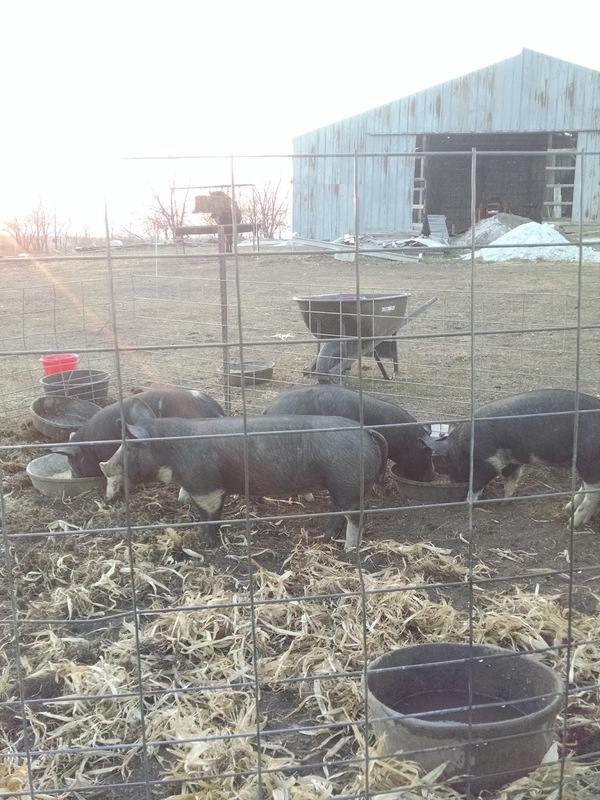 Once upon a time we had a big farm and raised 100 or so feeder pigs a year. 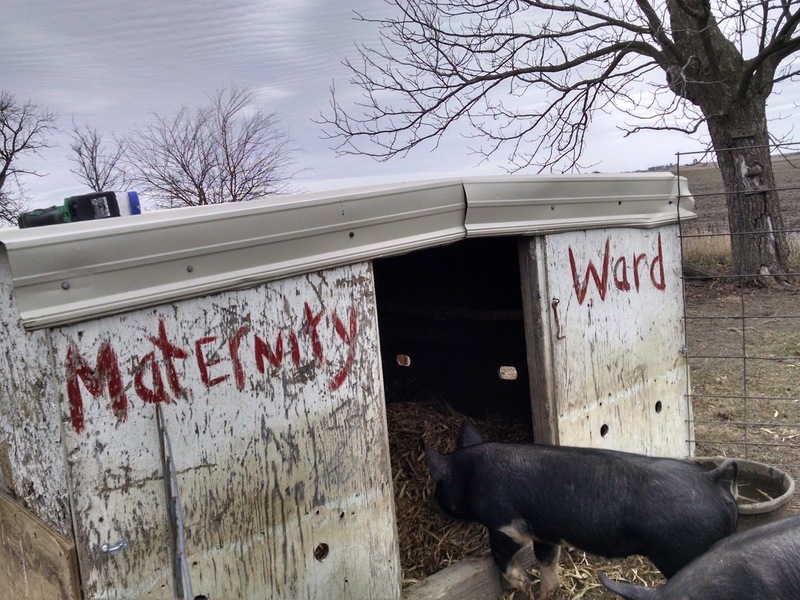 With our own breeding stock of Red Wattle hogs we had litters coming and going year round. 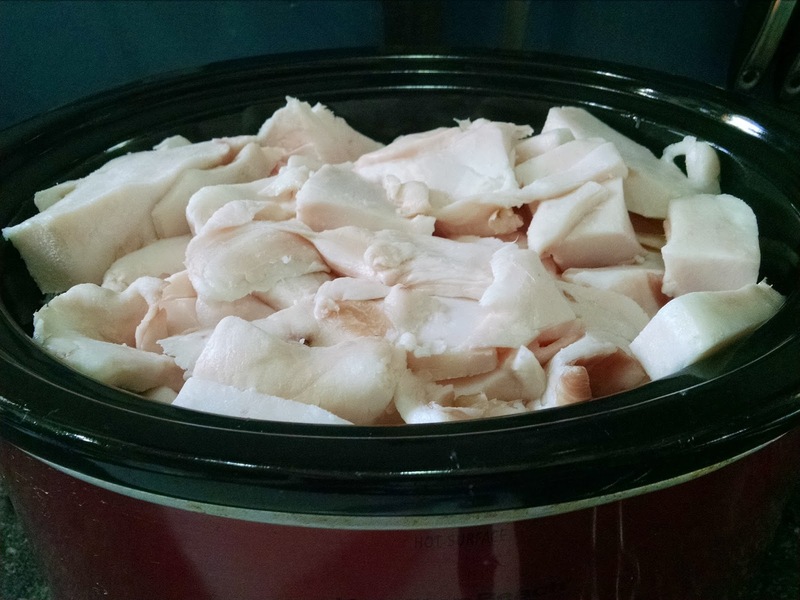 Some of those hogs went to restaurants, some to grocery stores, many to individual customers. And yet we rarely had enough for ourselves. It just seemed to make more sense to sell the bacon then to eat it. Fools we were. Then we got smart and downsized. 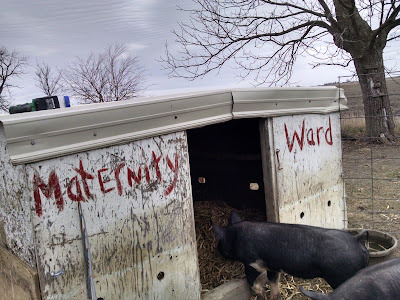 Sold all the breeding stock and instead each year we now buy just a few feeder pigs for ourselves and a family member or two. 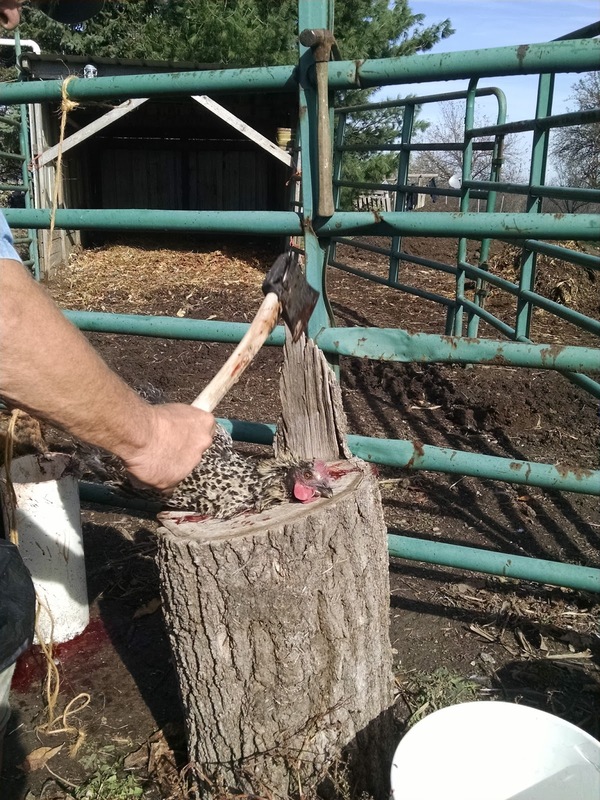 We generally buy them at two months of age and have them butchered at about 7 months. We took our summer stock to the locker in October. Last week we bought our spring stock. 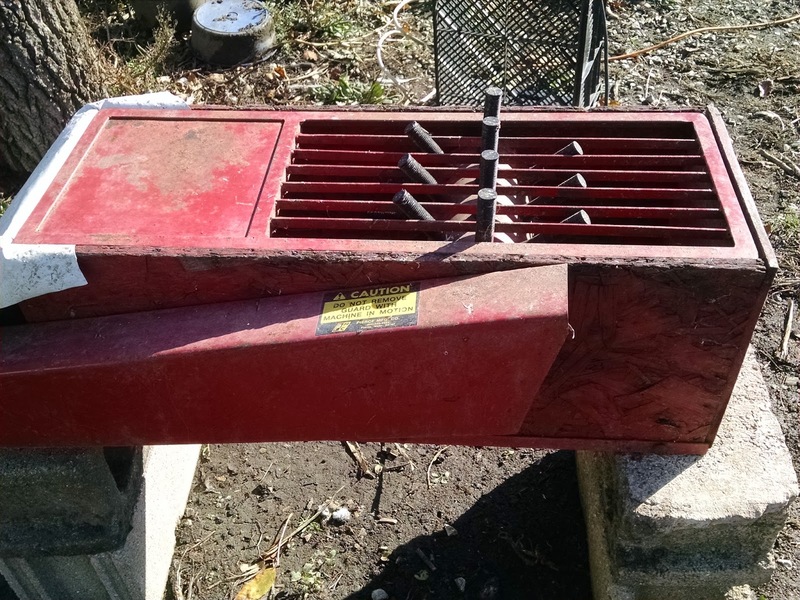 Ironically, due to our limited finances we can no longer afford to buy the awesome Red Wattle hogs we worked so hard to promote in Illinois for over a decade. Even at young ages, 8 weeks or so, they sell for between $125-150 each. But, another farmer friend of ours had some Bershire Cross feeders available. 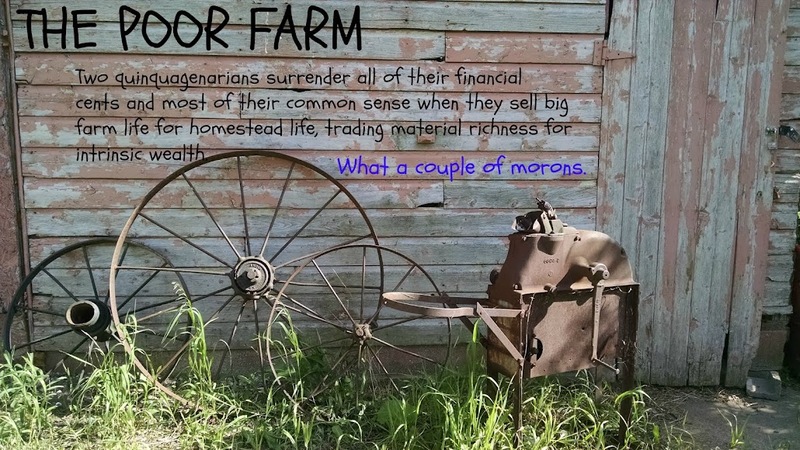 He thought they were already were sold but that other farmer never picked them up. 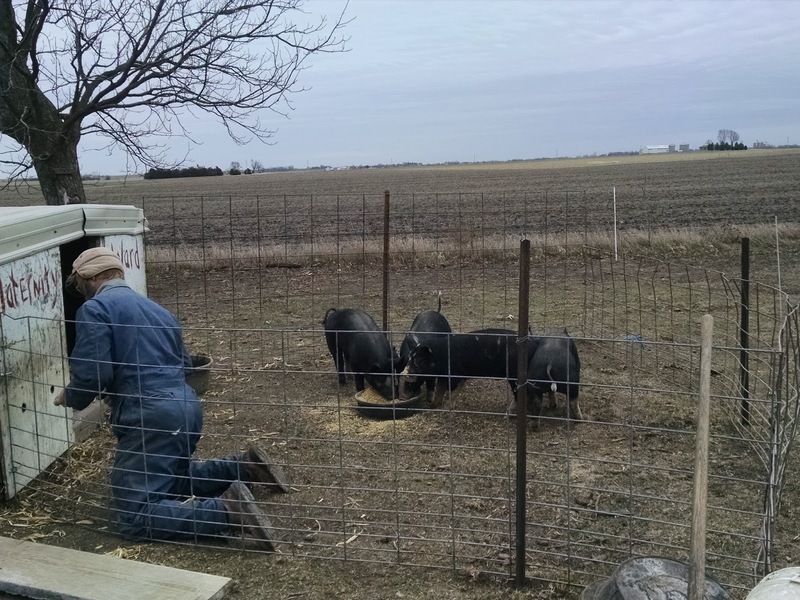 Anxious to decrease his large herd before the harsh winter hits, he sold us four fairly large piglets for just $70 each. A win win situation. 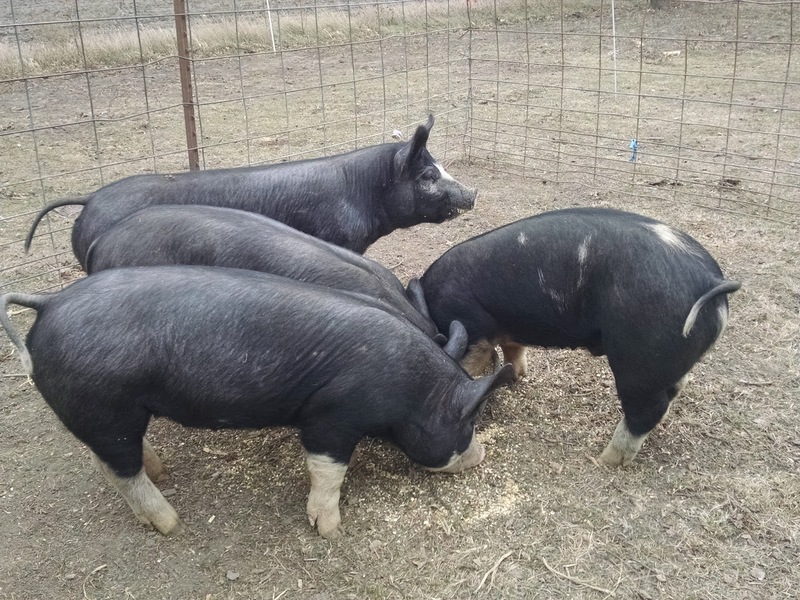 Already almost 4 months old, they've got a solid start on their chops, roasts and bacon. Because they have not been raised by us, and have run with a large group of hogs, they are not the friendliest group of porkers, (Red Wattles are real people pleasers) but they are healthy and adapting well to their new digs. I'm not that particular about their manners, I've been snubbed by bigger pigs in my life, I just hope they measure up taste wise. I so love Red Wattle pork. 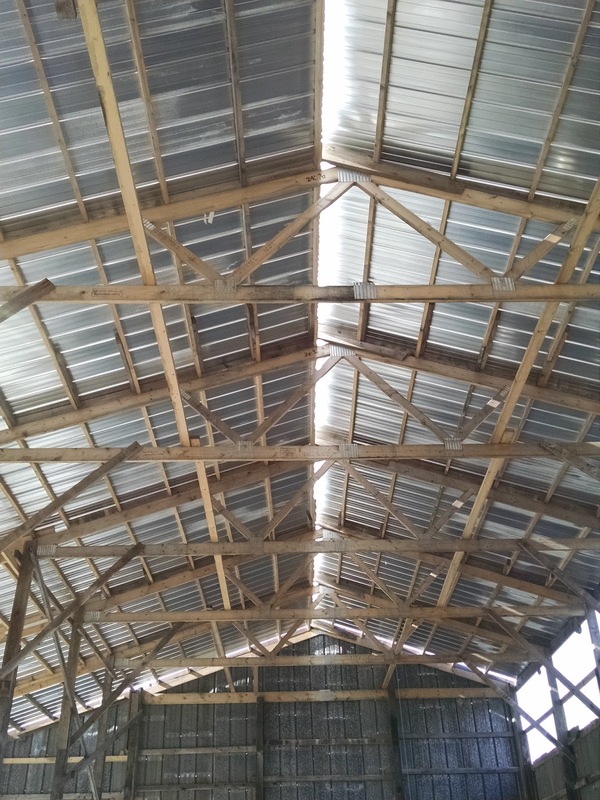 We've housed them in one of our old farrowing houses, which needed some repair due to damage done by the last porcine tenants, and filled the interior with deep bedding of corn husks. 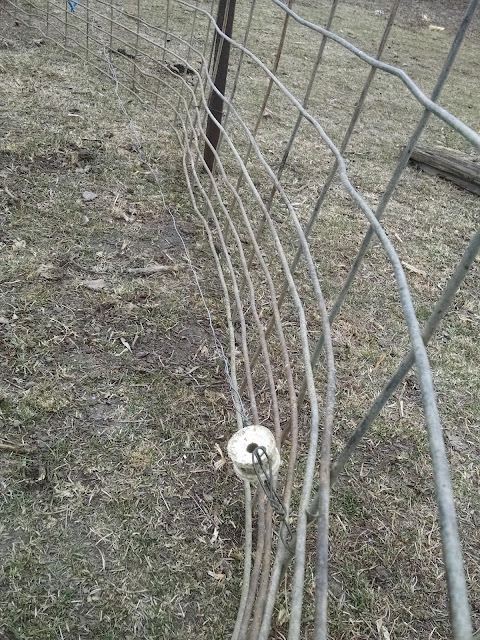 Three long hog panels act as a temporary pen. 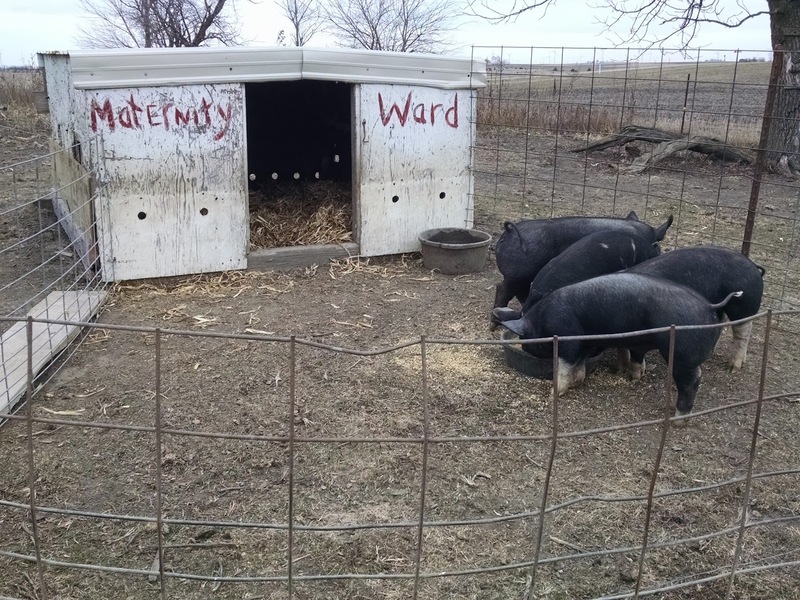 We always put our piglets in this type of smaller confined pen with a single hot wire across the back in order to train them to electric fence. Hogs have a tendency to go THROUGH a hot wire instead of backing up initially, so this pen idea works well to train them. After a couple weeks, when they are respecting the electric wire, we'll turn them loose into a much bigger area to root and dig and sun bathe. Even frozen ground can't keep a pigs snout still it seems. 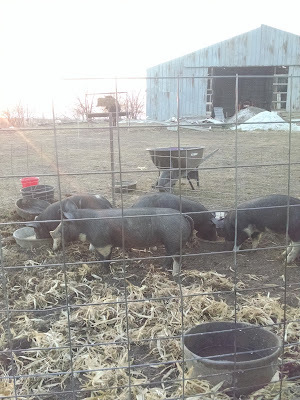 With a steady died of organic hay, ground corn and good kitchen scraps these little piggies should be ready for the locker sometime in April, about the time we'll get a few more for our summer sausages! 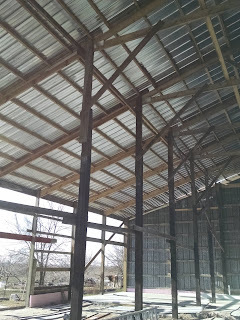 More barn progress, which is good because it's been mighty cold here in Illinois the last few days. Tonight it will drop to about 19 degrees F and snow is predicted later this week. 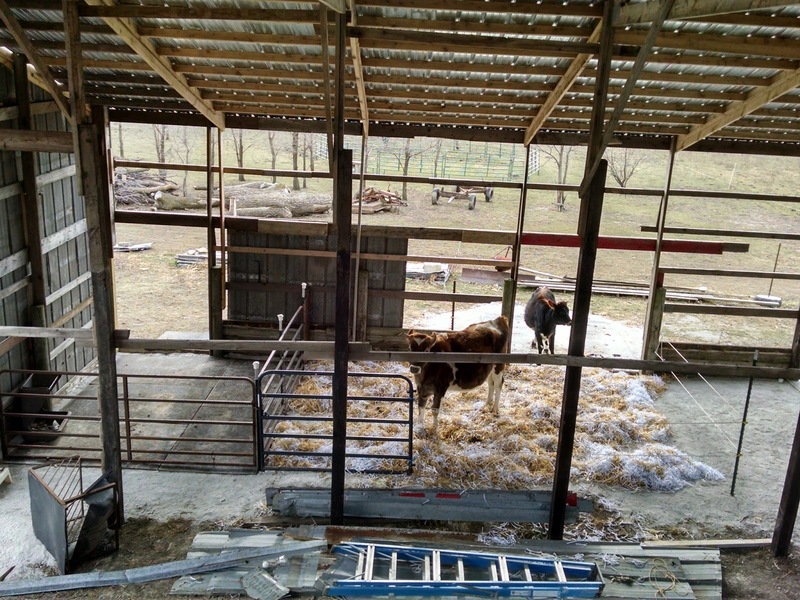 This weeks big deal so far was putting together stalls for the horse (one stall) and the steer and little heifer (sharing the other stall). Our cow Liz will remain in her separate 3 sided combo shed and milking arena until we can afford to run electricity to the new barn and set up the pressure tank needed for our milking equipment. 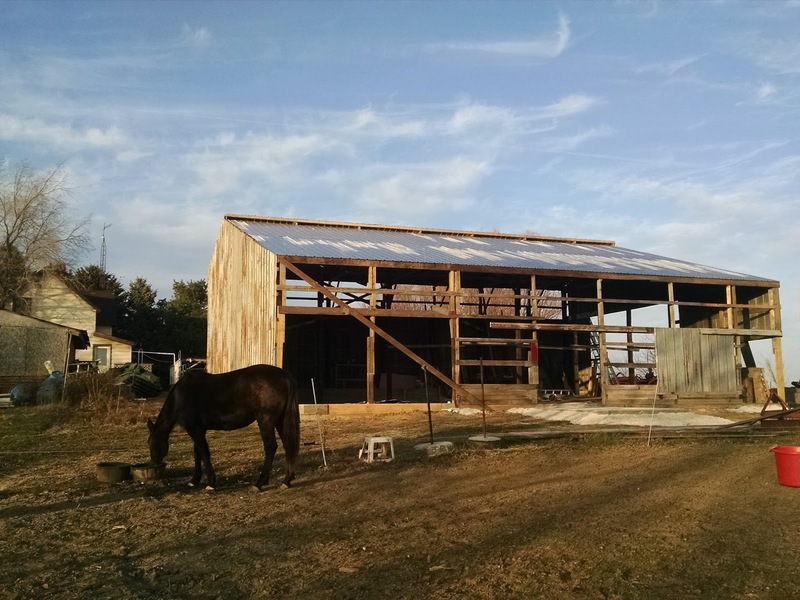 One day we'll have all the animals under one roof, but for now we at least have shelter for those who didn't have much before. 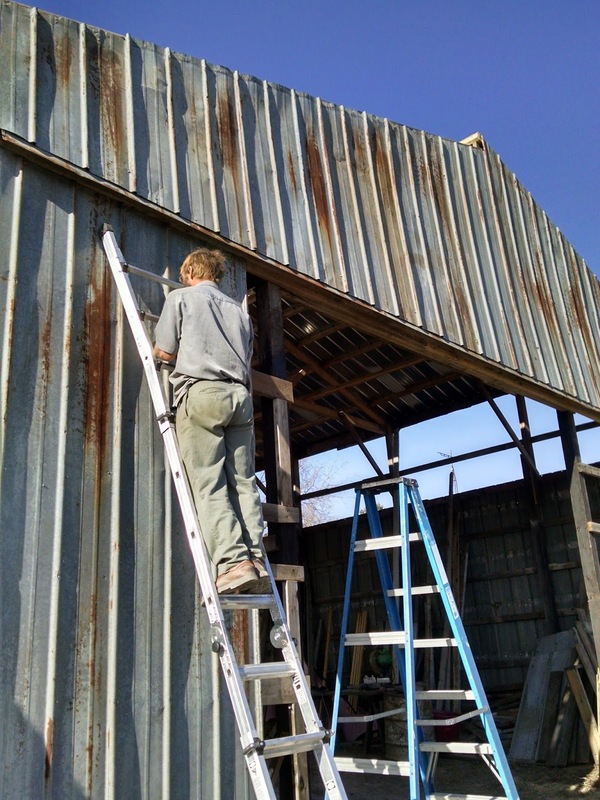 Additional progress was getting up gutters on the north side of the barn. 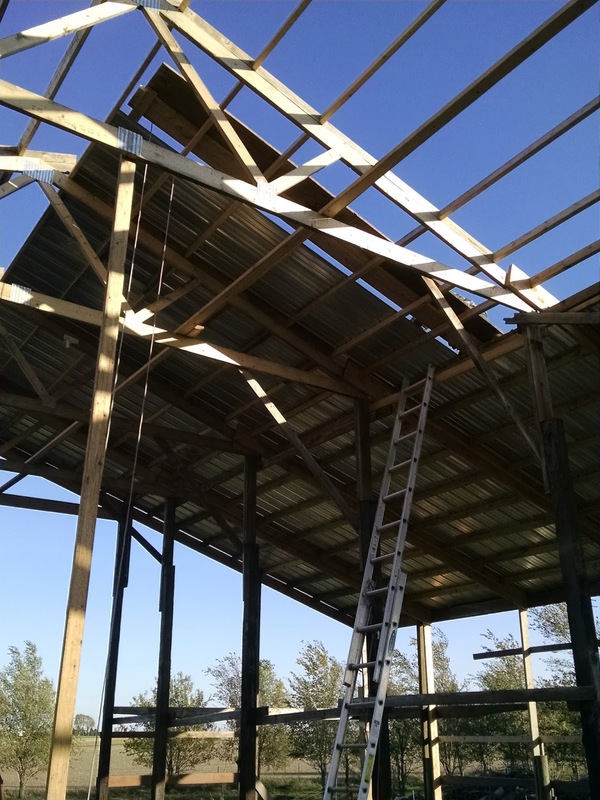 Because we do not have the funds for scaffolding or a man lift (don't we WISH!) 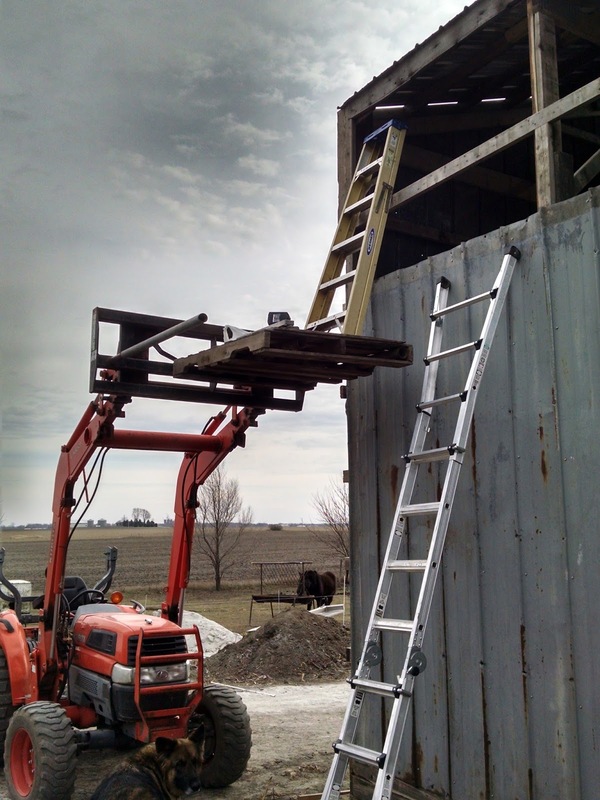 Keith has jimmy rigged a raised platform using our Kubota tractor. By placing long pipes on the fork tines and spearing them through the openings of a wood pallet, he's made himself a small platform that can be raised up and down as he needs it. 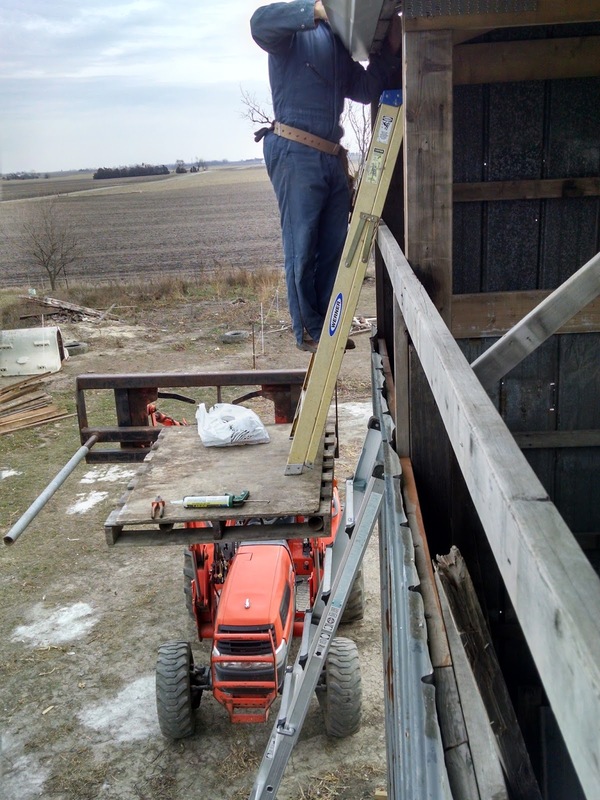 He placed a short ladder on top of that platform in order to reach the barn roof. 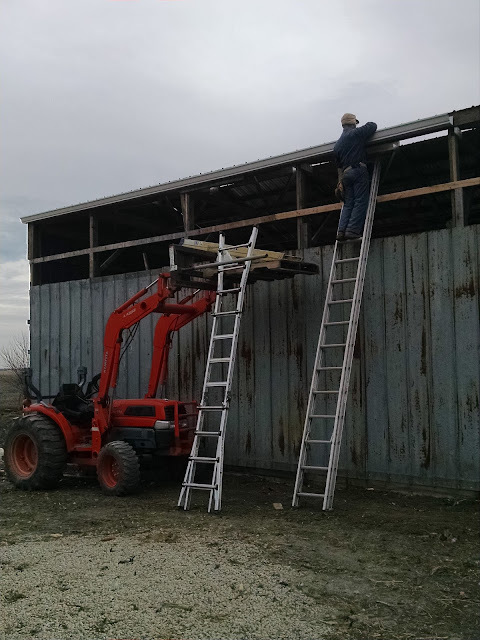 Of course he must keep another taller ladder close by in order to get off the platform and back down to the tractor so he can move the tractor and raise or lower the platform for the next task and then move the ladder to that new spot so he can climb back up onto the platform. Whew...wears me out just writing about it. All of this explains why Keith has never had a weight problem. 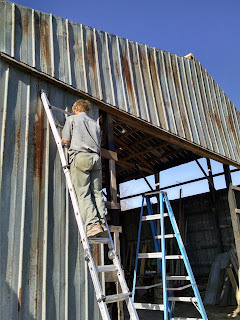 My role in the gutter attachment process was to climb up a third ladder, raise my end of the gutter and hold it against the barn while Keith moved his way towards me securing the gutter just below the roof. Since the gutters were not heavy I was able to hold my end with one hand and take a few pictures with my other hand. Good thing I had my smart phone because it was a pretty dumb maneuver while I was 16 feet up in the air. 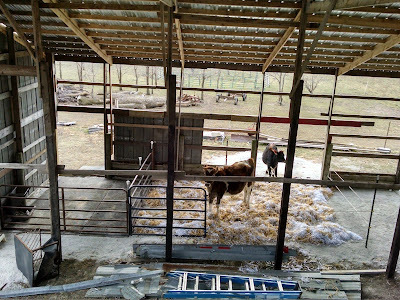 Still, I enjoyed the view of the animal's new stalls. and straw bedding over limestone. I always think it's only been 3 or 4 or at the most 5 days since I last blogged, and I am always shocked that it's been far longer. Time buzzes by me faster than I used to drive when I was 16 and my dad the cop was chasing me down for stealing, borrowing the family Ford. Excellent times. So since we chatted last Keith and our son Jason finished the roof of the new old barn. 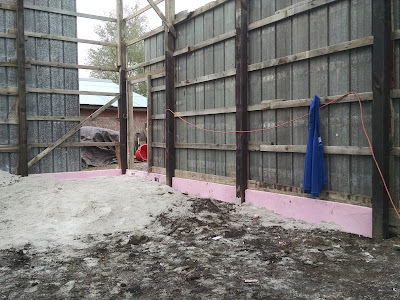 Keith then took a couple vacation days from work and got more of the walls constructed. 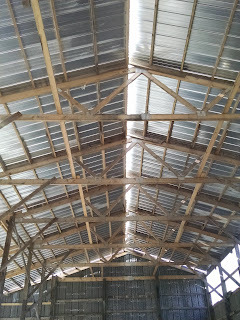 Because the roof is constructed of new steel while the walls are all the mid-century steel from the machine shed we had torn down, the new old barn looks like an elderly gentleman with a brand new very shiny toupee. In addition, Keith spread more limestone in the area which will be our livestock stalls. Thus our one horse, one cow, one steer and one heifer calf will soon be all snugged in for winter. Good thing since the temps dropped dramatically last night. Cold weather is here to stay I believe. 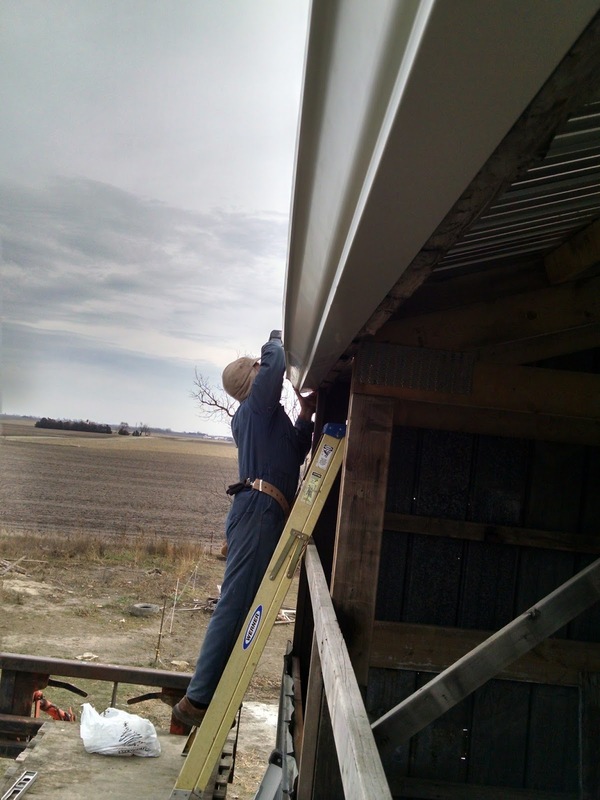 Attach gutters to the roof. And, that's enough to think about right now. 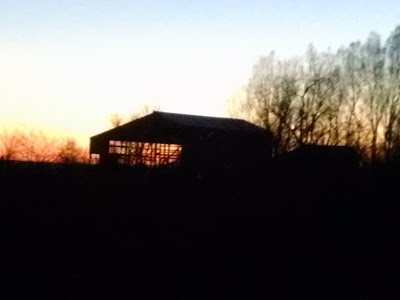 As long as this process has taken us, it's been rewarding to be able to see the barn from a distance. Inside it seems small, especially compared to our old barn in Chatsworth. 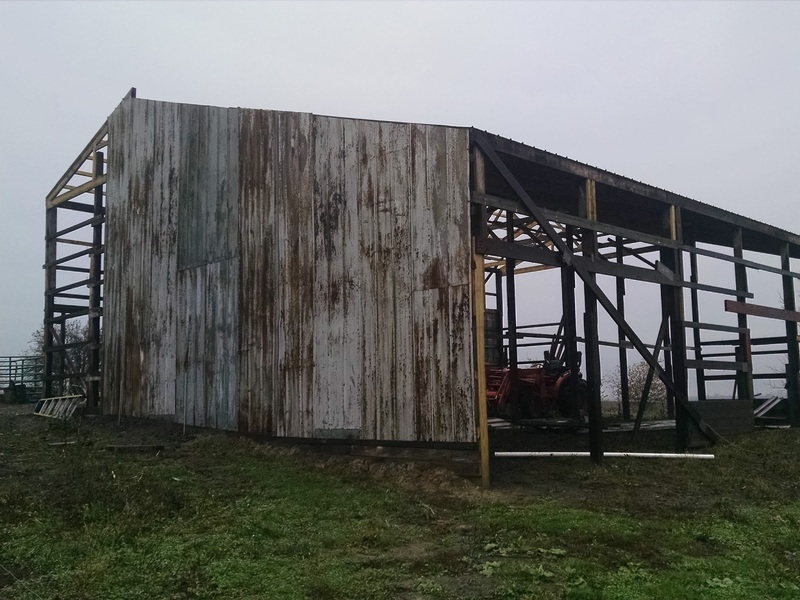 But when compared to the other smaller buildings here on The Poor Farm, it reigns supreme. 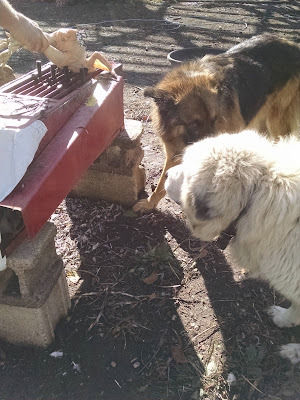 We are big time fat lovers here on The Poor Farm. 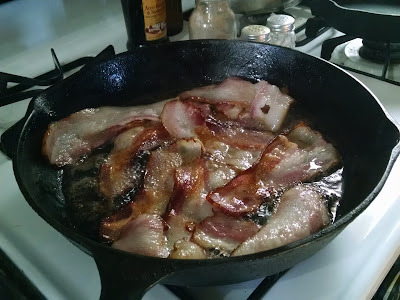 Bacon fat, coconut oil, lard or butter is included in most every meal. And Keith and I feel better than we have in years. This is amazing to me since I was "raised" on the American Heat Associations line of hogwash (but not hog lard) that proclaimed all fat is bad. Nurses are often given mega loads of misinformation. All part of the anything but, healthcare system. Organizations like Weight Watchers jumped aboard this ridiculous fat free train and convinced women that fat elimination and over dosage of fruits and vegetables would save their lives. Often hospitals paired up with WW and offered their classes within the hospital walls, collecting dues through payroll deduction. Women did lose weight, for awhile, but it all came back on. Mostly because these women were always hungry. 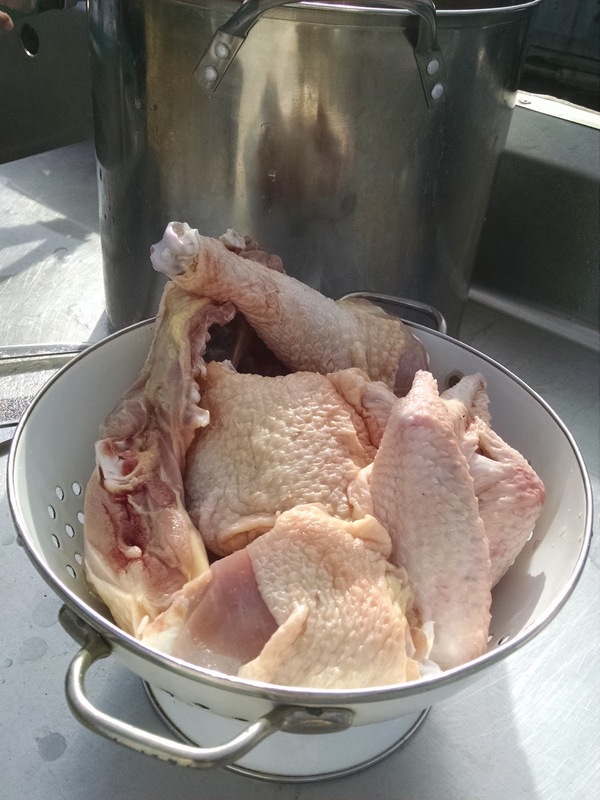 Minimal fats, and tiny amounts of protein left them unsatisfied. In addition, so much, these WW type companies produced frozen and well preserved premade foods that were low fat, but high in sugar, especially corn syrup. It's not fair to pick on one diet fad, I know, being there are hundreds in this country alone, but they do all share one premise: make the consumer dependent on the company's doctrine rather than teach them the basics of good nutrition. I feel qualified to have a solid opinion on all this because I am...fat. I was not a fat child or teen, far too little food to go around for that, but I lost all control when I got pregnant and gained 50 pounds with baby number one. When baby number two came along just 14 months later I packed on another 30 pounds. I clung to that weight another two decades and then in 2000 I jumped on my own fad train, the Atkins Diet. It worked really well. I lost 100 pounds in one year and felt fantastic. I also blew out my gallbladder which is a common occurrence in women in their 30's and 40's who lost a large amount of weight. Eventually I tired of the low carb deal and I gained back 50 pounds. I'm Irish, love my bread and potatoes. Over the last 15 years I have remained steady at a luscious size 18. 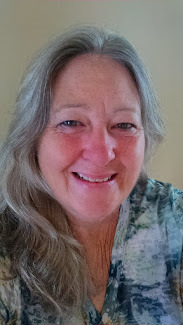 Nearing 60 I thought I would never feel motivated again to drop some of that extra load but a sister of mine took The Whole 30 challenge and she felt so much better, motivated to increase her exercise and eat less processed food, it inspired me. So, I'm following her lead as are my other two sisters. We are all seeing results and feeling better. Whole 30 isn't a diet so much as a break from all the processed foods including all sugars and grains. I was not eating that much in the way of processed foods but I sure was eating my share of bread and taking way too much honey in my 8-10 cups of tea every day. You're not meant to be on The Whole 30 plan for more than thirty days, thus the name, as the whole premise is eliminating those processed foods that may have caused you issues such as heartburn, inflammation, insomnia. You give your body break and take the time needed to learn which foods work for you and which clearly do not., then slowly and with reason, you add a little sugar, some grains back to your diet. Hopefully, being much more selective amount the types and amounts. What I love about Whole 30 is you don't pay membership fees or have to buy the book. There's always a book isn't there? 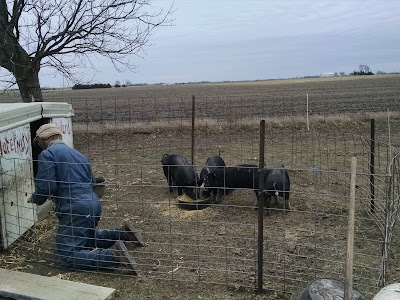 You are encouraged to eat pasture raised meat, which I already did, and healthy animals fats, but the rest of your food needs to be prepared by yourself. Jars always on my counter filled with lard, bacon grease and coconut oil. 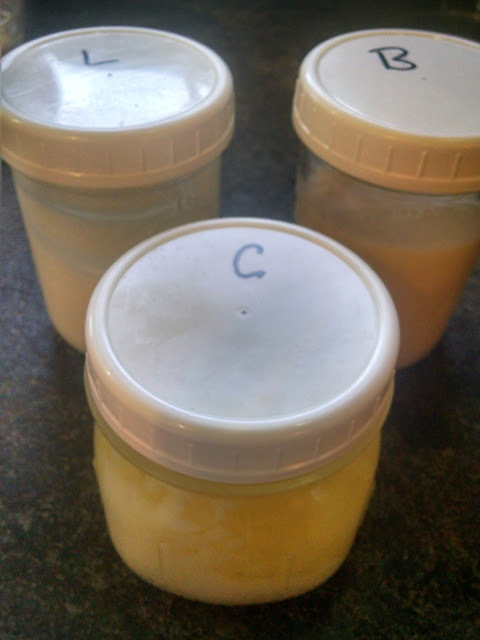 I also keep a bottle of olive oil on my stove and butter in various stages like Ghee. 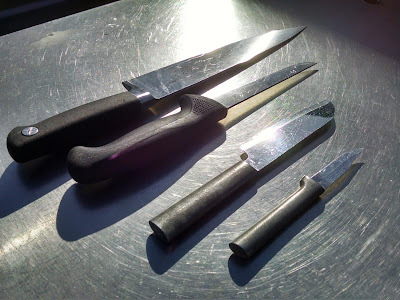 Seems I am washing, cutting, prepping, cooking food all the time, which is what a homesteader should be doing anyway, right? Now, this quinquagenarian is down almost two sizes and up in energy levels I haven't felt in decades. My main motivation was the addition of two new GK's last month. I want to be around for them, to be able to help their parents when needed, to have the ability to run after them, to play with them, to wrestle with them, to attend their school events and future weddings, to love them and their four older cousins, for a very long time. I also don't want to wear out my pallbearers when they haul my carcass down to our family cemetery! 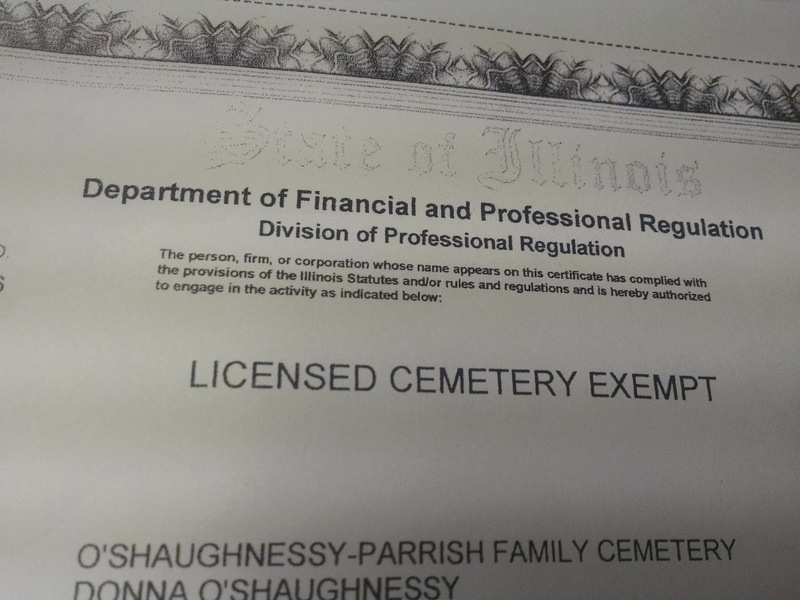 It's true, after a year of phone calls, regulation research, conversations with coroners and funeral home directors, our attorney and several meetings with our county officials--The O'Shaughnessy-Parrish Family Cemetery is a reality. In our opinion, this "zoning variance" granted by the county, is a cause for celebration. It means that Keith and I and those related to us by blood or marriage, can be buried naturally in one of the 18 approved plots. No embalming, no metal boxes, no expensive vaults. Wood caskets optional. If that is their desire of course. Anyone who chooses to spend on average of $7,000 to $10,0000 for a traditional visitation, funeral service and large cemetery burial with all the bells and whistles of velvet draped funeral homes, fancy caskets with silk pillows, and concrete vaults that do nothing to preserve our bodies no matter how much moola is invested, is welcome to follow that route, but they'll have to do it elsewhere. 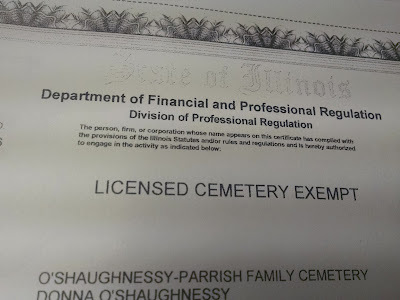 For family members who would rather leave their money to loved ones or deserving agencies, instead of burying it in the ground, we can now legally offer them a less expensive alternative. Sorry, we can't accept deposits as there will be no charge for this end-of-the-line vacation resort, nor will we take reservations. 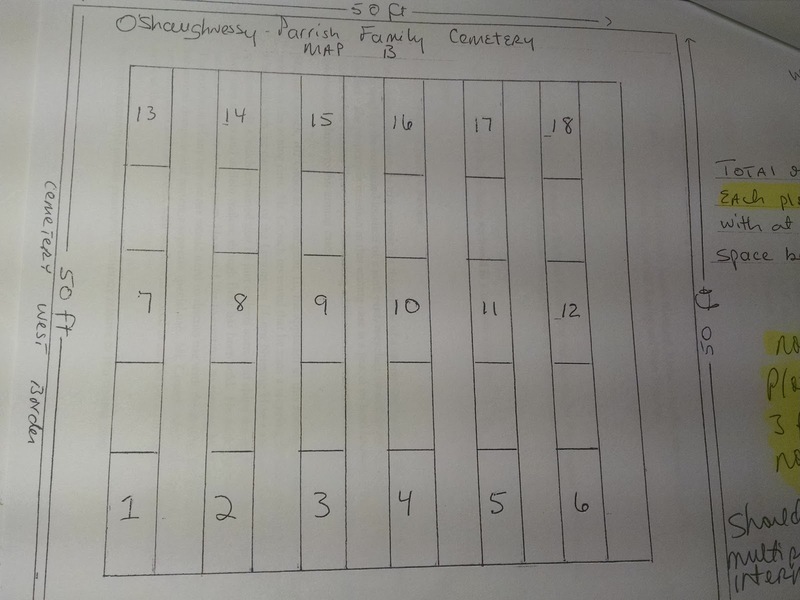 I myself have my eye on Plot Number 1 because it's the farthest from the road, but if someone beats me to it, I'll be mature enough to step aside. All in all the process was only mildly painful, but would've been less time consuming if I'd run across even one informed state individual who could've walk me through it step by step. Or at least pointed me in the right direction. 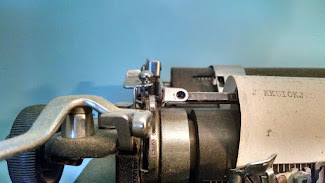 I was often given inaccurate information or sent to the wrong offices for info gathering. 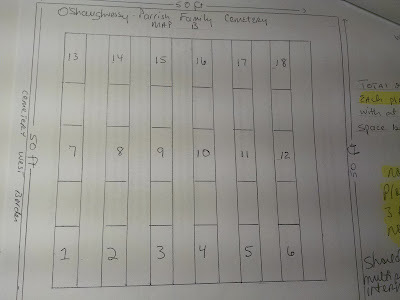 Additionally this was the first Family Cemetery request our county board could even remember and they too were unschooled in the specific requirements. The state rules and regulations were disjointed, duplicative and scattered about the internet in the form of outdated applications, instructions, and phone numbers. When I finally tracked down the right people in the right offices, those representatives knew nothing of the county or federal requirements. There were no specific county requirements thus the reason we had to request a variance permit and present our case at three separate county meetings. 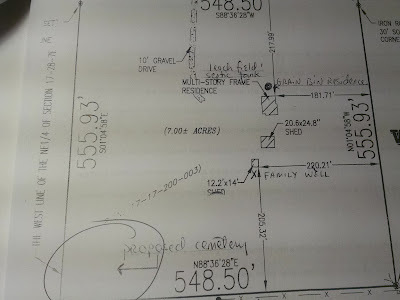 The "variance" being we wanted to use land zoned for agriculture ( a small portion of our property which was 2500 square feet or approximately 1/17th of an acre) for a different use, i.e. a Family Cemetery. The neighbor who protested at the first two county meetings insisting we would lower the property values, didn't bother to show up for the last meeting so perhaps she's gotten used to the idea. 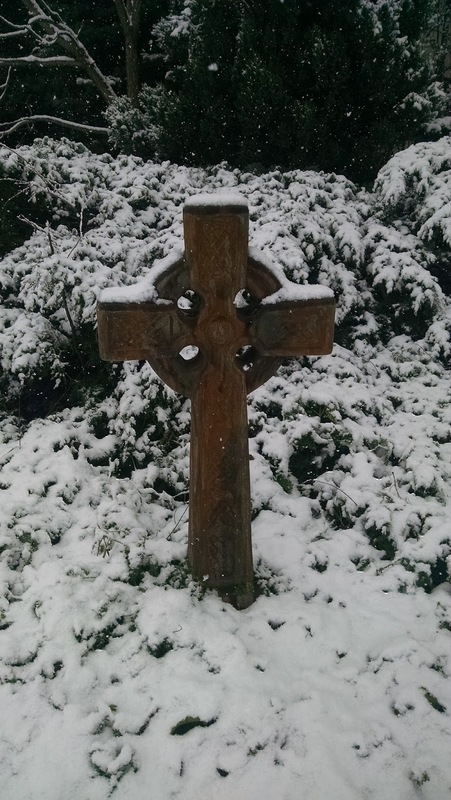 Anyways, it's all good and next time friend Jay comes to visit we're going to move the four foot tall Celtic Cross he gifted to us last year, down to the center of our cemetery. He's a bricklayer by trade so we'll have him build a short pedestal for the cross. 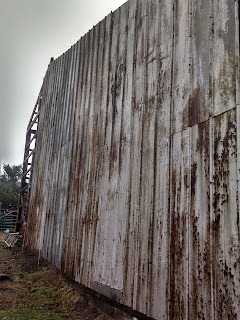 Now to find some antique wrought iron fencing for the perimeter. In the spring we plan to plant lilac bushes there as well. 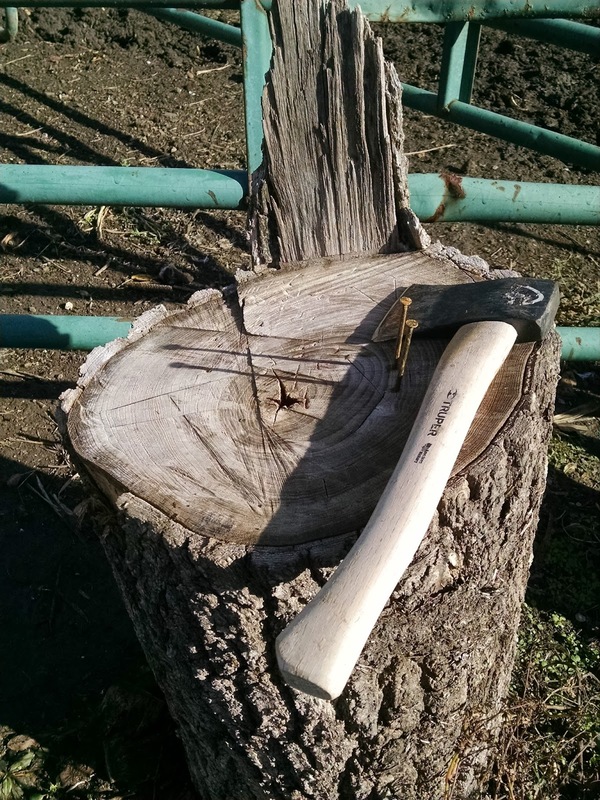 Maybe carve out some benches from the Oak trees we felled to make room for the barn. 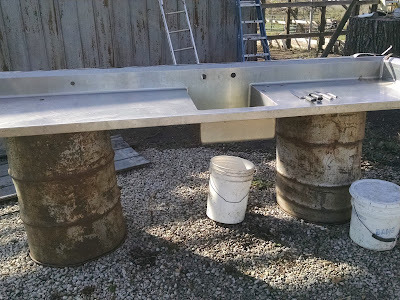 A fountain of some sort. Maybe even a hot dog stand! Kidding...Or am I ? So excited, I can hardly stand it!! 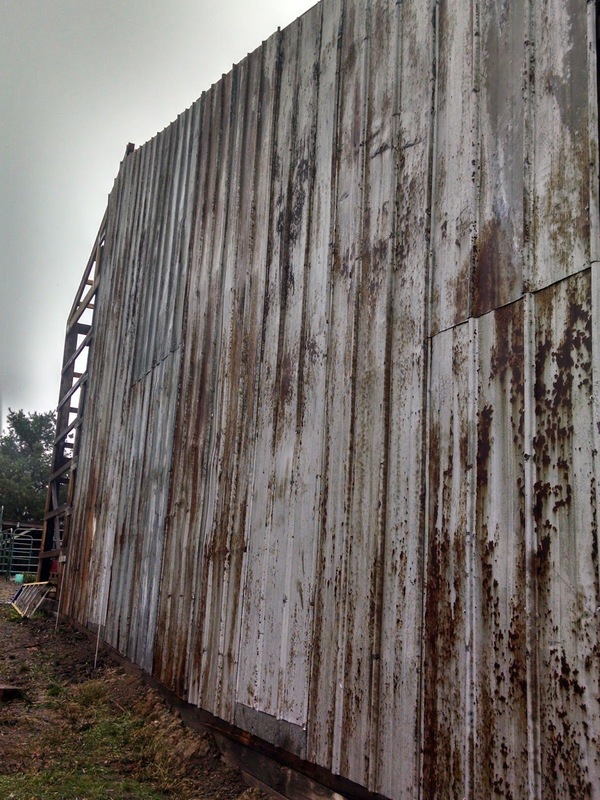 The barn, our eclectic creation of recycled wood and metal, continues to inch towards completion. Completion being a flexible term. 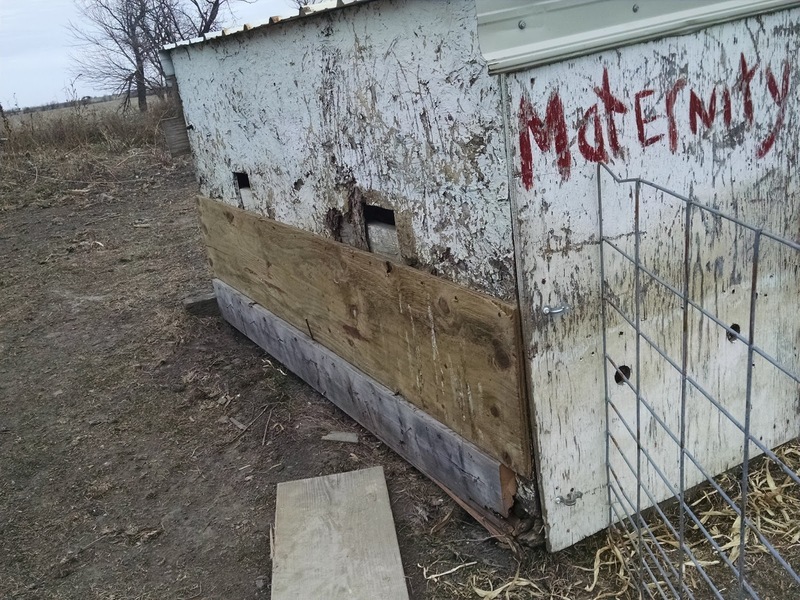 For us it means a good enough shelter for our animals this winter. 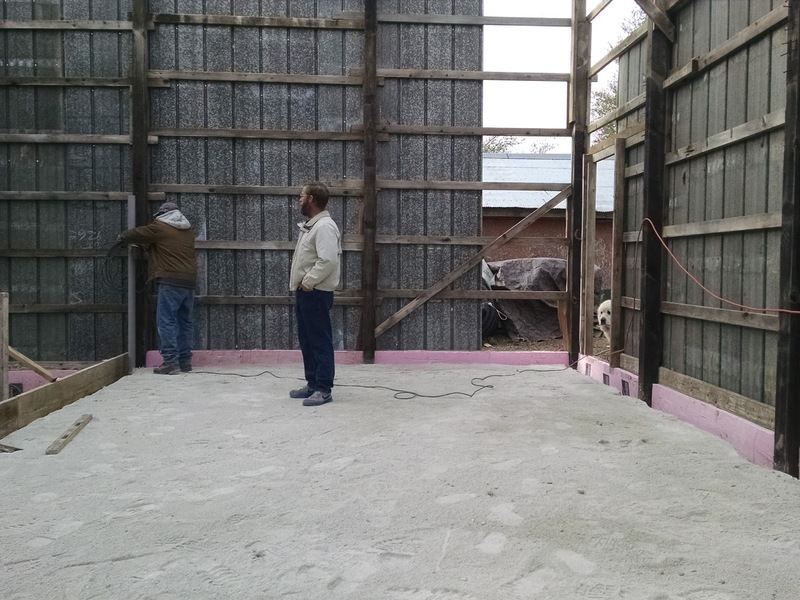 Future completion would include the walling in of Keith's shop as well as the storage room within the barn which will house our meat freezers, extra refrigerator, well pump and vacuum pump for milking our cow. All in good time my pretty, all in good time. Two weekends ago friend Jay came again and with son Jason's help the roof was half completed. Without any fancy (i.e. expensive) man lifts or rented scaffolding, we slid the long steel panels up the ladder where Jay grabbed on and pulled them up the rest of the way. Kneeling up high (prayers are always appreciated) he screwed in each panel. 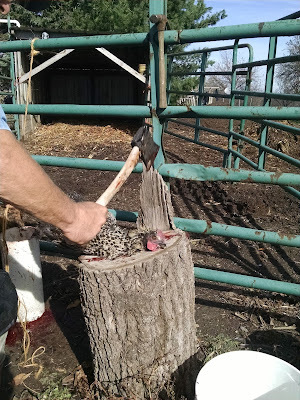 After that he and Keith would move the wood kneeling boards back another three feet, and we would repeat the process. Later this week it turned rainy and cold which slowed down both the barn build and the final leg (breast and thighs) of our chicken butchering plans. Oh well. 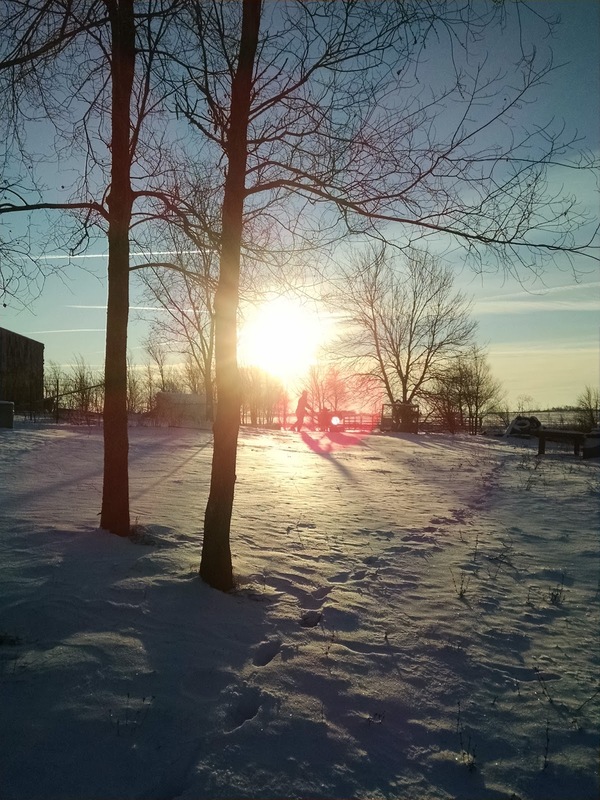 Next week the weather will warm a bit, if weather predictions are correct. Usually they are meaningless, but we look anyway. 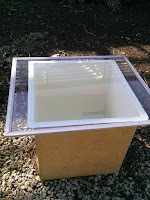 Hope allows us to plan the outdoor tasks we need to complete, not to mention about three loads of laundry I am behind. 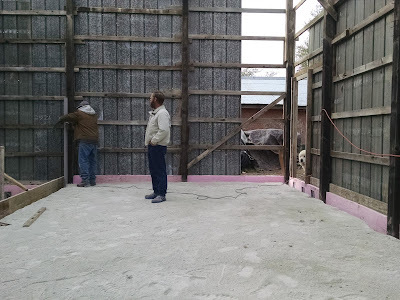 A couple of days ago the concrete guys came and dug out the areas for Keith's shop and our storage room. 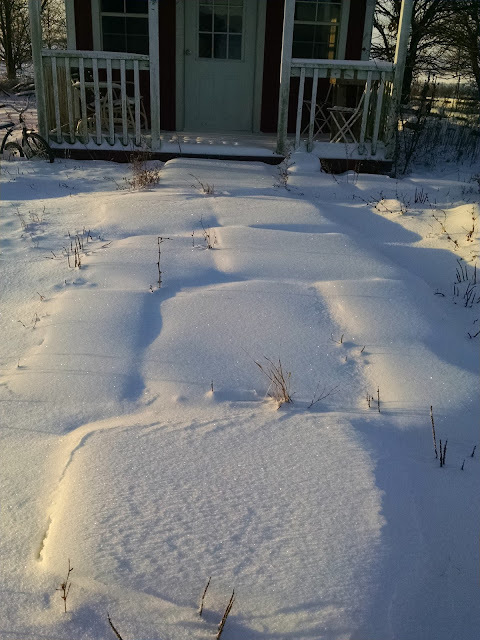 These rooms are two different levels due to the slope of our land. 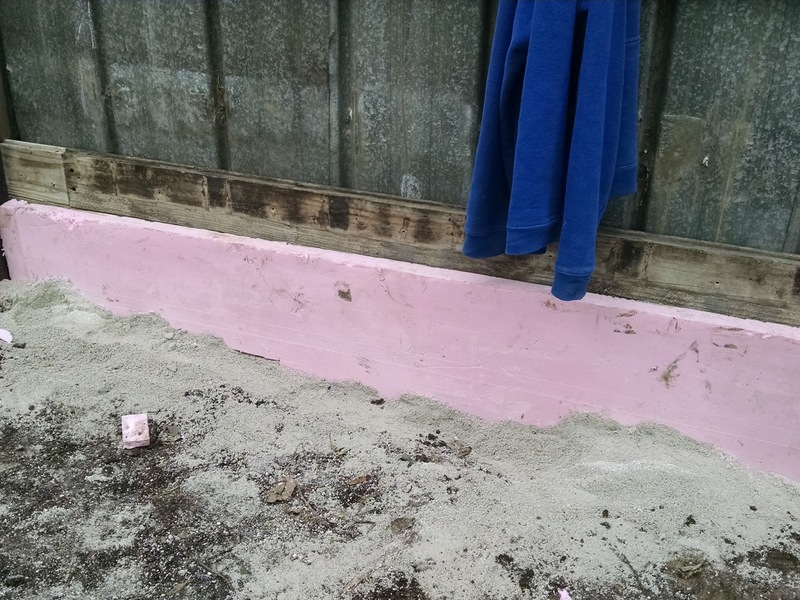 A trench was dug for the foam insulation boards and the concrete footings and then they filled the area with limestone. 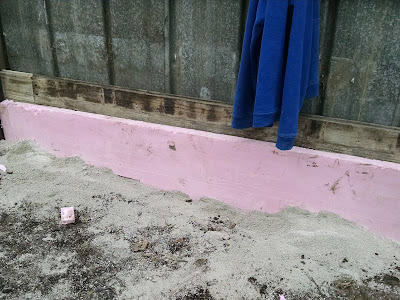 If the weather cooperates they plan is to pour the concrete then. 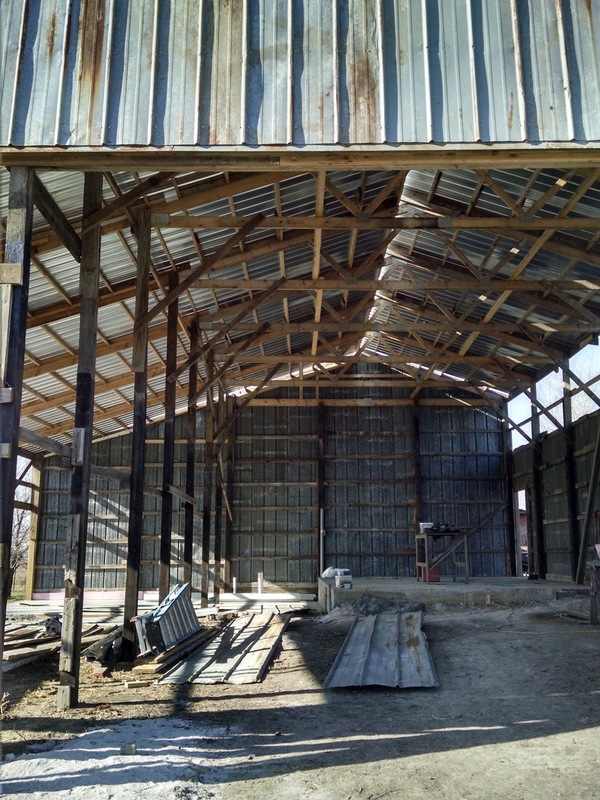 Inch by inch and dollar by dollar, we pay as we go rather than use credit, the barn becomes a reality. Chicken Butchering Time and a New Grandson!! Warning. if you are a vegetarian or someone who believes all the meat they buy in the grocery store or order at the restaurant comes from a magical mystery place where all animals just drift into the freezer department by the gilded propellant of fairy dust, then this blog won't be for you. But if you believe as we do, that a certain amount of responsibility comes with being a meat eater, that the best meat comes from humane family farms rather than factory farms, that raising your own meat is one of the healthiest things you can do for yourself and your family, then read on. Last week we tackled the all important,but not so much fun task, of broiler chicken butchering. We've done it every fall for many years for one basic reason: the meat is so much better. 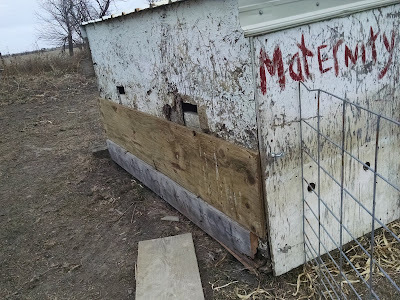 We raise them outdoors, with organic feed, leftover milk from our cow and lots of run to roam. 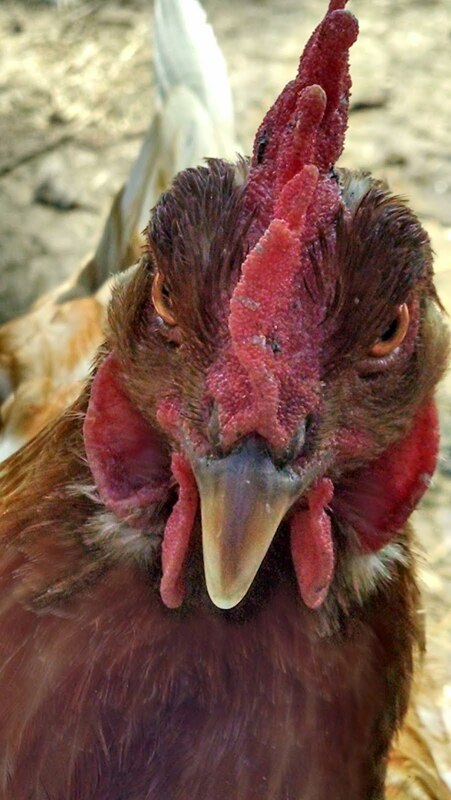 They get to scratch in the dirt, eat bugs and grass and act like real chickens, unlike the millions of birds raised in this country in horrific, crowded, indoor conditions. 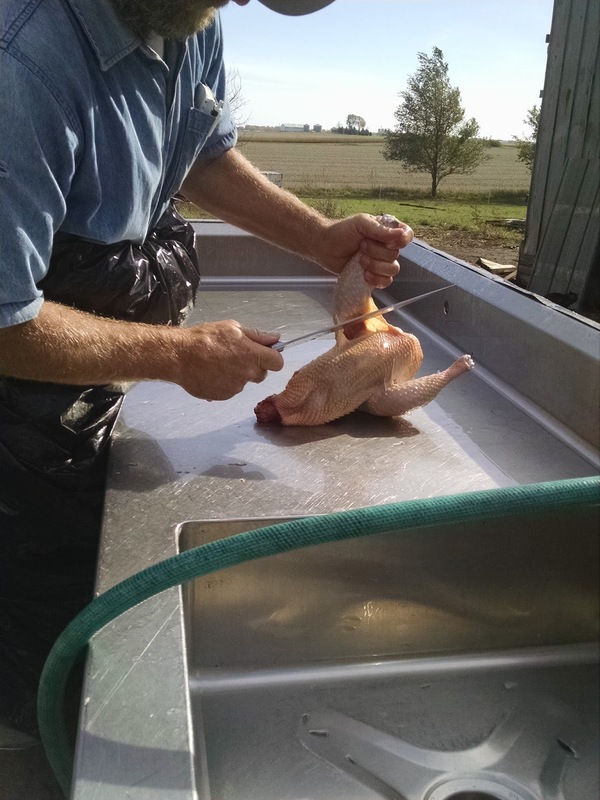 Normally we purchase 20 or so but we hated running out of chicken before the next fall so we bought 31 newly hatched broilers this time. Still not enough for the whole year so we plan to buy more in the spring. 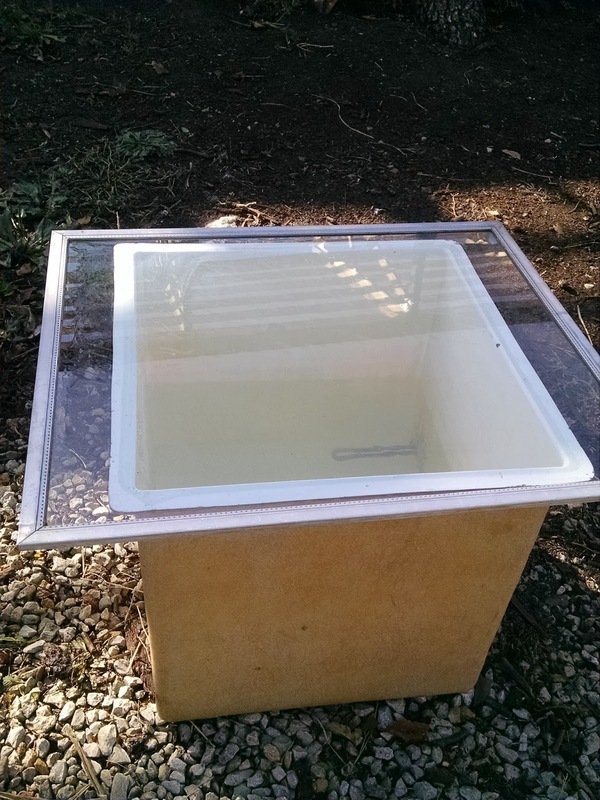 When they arrived several weeks ago, we kept them under warm cozy lights for a couple weeks then slowly acclimated them to the outside. Then they were turned into an old garden area which we expanded by week four into a larger part of the old garden. 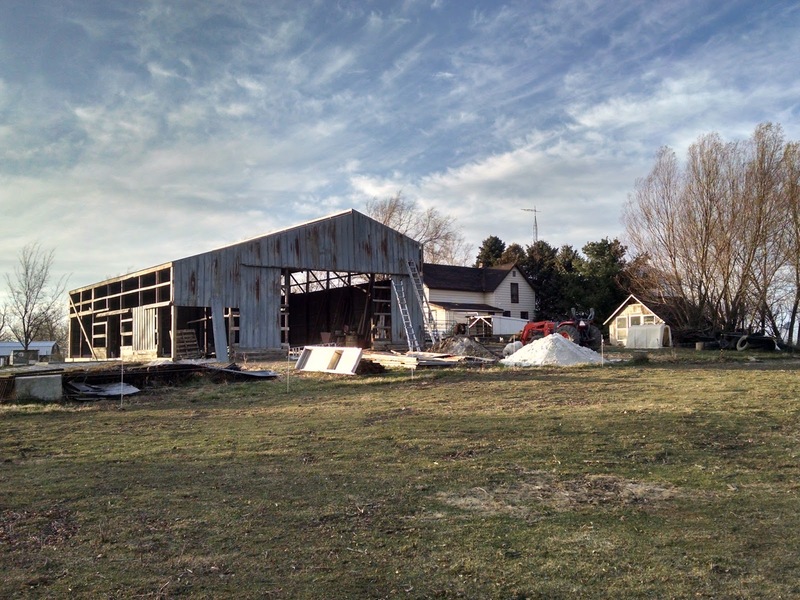 Two weeks later we expanded that into a large pastured area with grass and more bugs and lots of room to run. By the end of their time with us the number though had decreased to 28. Not sure where the other three ended up. 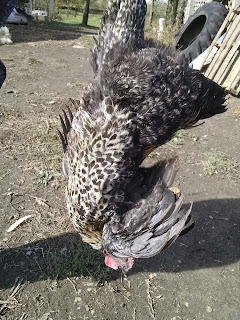 Possibly in the belly of a hawk, or the jaws of a hog, we have chalk it up to the cost of doing business. Because Keith is home just a few hours each day during the week, we were only able to get 10 chickens in the freezer, but we hope to complete the rest of the group later this week. 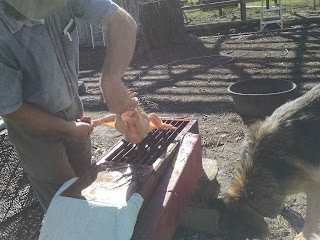 It was in the high 50's on Tuesday and not too windy, so after prepping our cutting table, the feather picker, the scalder, the chopping block, as well as sharpening knives and gathering buckets for the blood and the offal (intestines, feet, heads ), we got busy. It is a time consuming and very messy job but the satisfaction of raising, humanely killing, preserving and later preparing your own meat is immeasurable. It did kill them quickly, but I am still unsure which process I prefer. Yes, they do flop about and blood does splatter if you don't put them in the plastic field tile right away and allow the blood to drain, but I hated the throat slitting method we've done up until now. For me it seemed more barbaric, and I believe even though it lasted only a few seconds, more painful. The clean cutting off of the head, the absolute separation of church from state appears most humane. Humane killing. An oxymoron if ever there was one. Also, it was cold enough that we had no flies to deal with, just a couple of mongrel dogs who love standing by for the offal which they believe is pretty wonderful. Now, the really wonderful news...Ten days after the birth of our fifth GK, the sixth GK arrived. Son of our youngest boy Kyle and his wife Amanda, the awesome Eli was born last evening. He weighed over two pounds more than his wee cousin September and evens out the score. 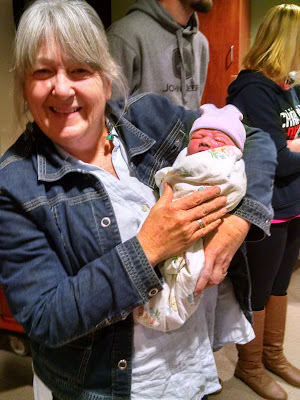 We now have three granddaughters and three grandsons. So much to be grateful for .